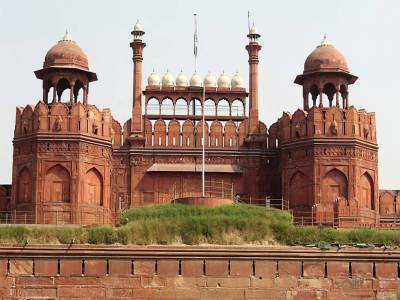 The Lal Quila or Red Fort is a historical place in the city of Delhi, India. The Red Fort is the largest monument in Delhi and the most popular tourist destinations of India and attracts thousands of visitors every year. It's 17th century Mughal composition build by Shah Jahan. It was the main residence of the emperors of the Mughal dynasty for nearly 200 years. Constructed in 1639 by the fifth Mughal Emperor Shah Jahan as the palace of his fortified capital Shahjahanabad the Red Fort is named for its massive enclosing walls of red sandstone. This massive walled citadel with red sandstone walls took nearly a decade to complete. The last Mughal Emperor Bahadur Shah Zafar was coronated here in 1837, during which time it is said that his powers did not extend beyond the boundaries of his palace. If someone are willing to explore the historical monuments in New Delhi, this is one of the best option. The educational tourists can gain a lot of knowledge from here, innovative architectural style and many other designer buildings inside the red fort complex. The weapon museum inside Red Fort complex is must see attraction. The sound and light show describing Mughal history is a tourist attraction in the evenings. The Red fort contains all the Equipage of the Mughal government i.e halls of public (Diwan-i-am) and private audience (Diwan-i-Khas), plush private apartments, domed and arched marble palaces, Pearl Mosque (the Moti Masjid) and richly designed gardens. Some other attractions of Red fort includes Royal Bath (Hammam) and Shahi Burj (the Shah Jahan private working area). Every year at 15 August on the India Independence Day Celebration, the Prime Minister of India hoists the national flag at the Red Fort and addresses the peoples. Netaji Subhash Marg, You can get down at Red Fort Metro Station. Gate no 4 to reach here. Get quick answers from travelers who visit to Red Fort.